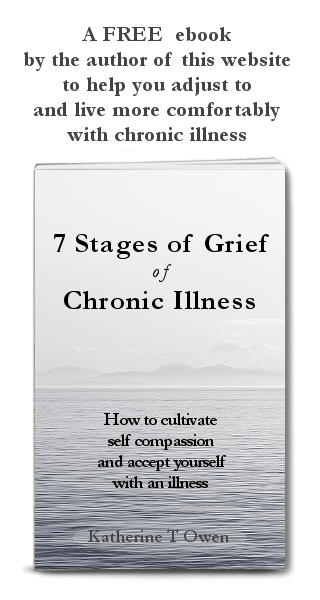 These articles on the 7 stages of grief in chronic illness are NOW available as a free ebook, including additional information. Knowing about the stages of grief helps you to be gentle with yourself in a time of illness. The link above and the cover below take you to visit my healing website where you can collect the book. "I’ve Lost My Health And I've Lost So Much"
What Are The 7 Stages Of Grief? Books about the original 5 Stages of Grief - Who invented the stages? We go through the stages of grief when we suffer loss of any kind. I lived with very severe chronic illness for 17 years, and continue to live with a milder form of Myalgic Encephalomyelitis /CFS today. The FREE ebook focuses on how to grieve a loss of health when we live with chronic illness. We can lose our identity as mother, father, worker, happy person, busy person, creative person. The illness may take away our ability to perform the family role that feels most comfortable to us. We can lose relationships as those unable to accept the illness fall away. We may have to move from where we live to somewhere adapted for the illness. I am so happy to offer you a FREE ebook on chronic illness as there really isn't enough information available to guide us through grieving loss of health. Where appropriate I link to articles available on this or my other website. Please know that ALL these articles are included in the FREE ebook. "What Are The Benefits Of Feeling Anger?" How Do We Move From Bargaining To Acceptance, And From Guilt To Humility? We Stop Pretending We Are Not Ill. We Feel Our Feelings. How Can I Learn To Feel My Feelings? My journey through the 7 stages of acceptance of illness. Who developed the Stages of Grief? Elizabeth Kubler Ross worked with the terminally ill. This led her to develop the five stages of grief documented in her book "On Death And Dying". She found that many people who were facing death were glad to be asked questions about how they felt. Their experience was that most people were not able to allow them to talk about death. 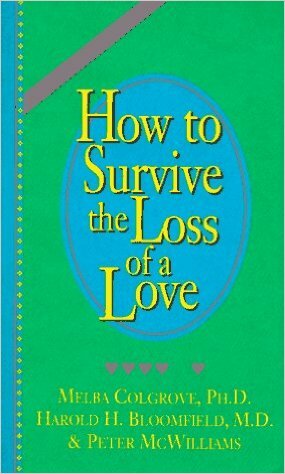 Looking up the book to recommend it here, I see Kubler Ross also wrote a book called "On Grief and Grieving" which may be more appropriate to living with chronic illness. It was soon realised that these 5 stages of grief apply to any area of our life where we experience loss. Since Kubler Ross, others have expanded on the steps to give 7 stages of grief. These can include "shock" (I include this in denial), "guilt" and "reconstruction of one’s life". You will find the 7 stages of grief are listed a little differently wherever you look. They can also be named the 7 stages of acceptance of illness. And I have also seen these steps referred to as the Change Cycle. Going by my personal experience, you are likely to receive a great deal of bad advice when ill. Some of the people you love will be going through their own journey with your illness. They may be in the same phase of grief as yourself and speak to you from a place of fear or anger. They may move away and simply deny that you are ill.
Others who do not know you well may not have the knowledge or experience to advise you, but will advise you anyway! When you identify which of the 7 stages of grief you are at, you are better able to decide which is good advice and which is bad advice.